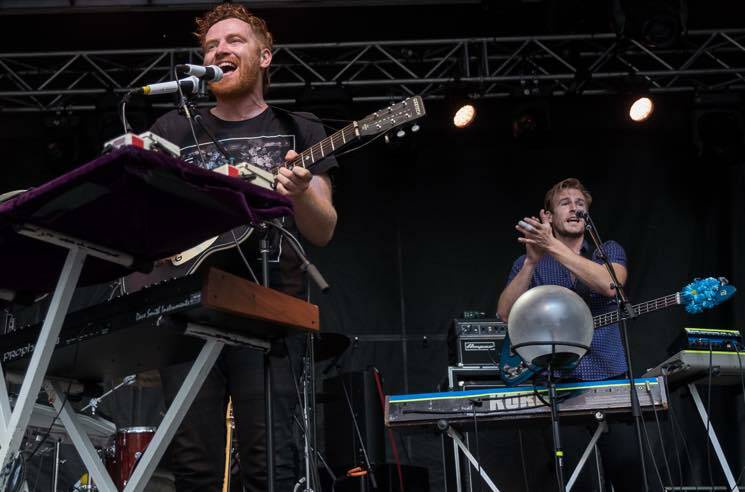 Last year, Royal Canoe were set to rock the Supercrawl crowd until a torrential downpour cancelled their set — the only casualty of last year's rainstorm. This year, while a light drizzle brought an ominous sense of déjà vu, the band's set proceeded without a hitch. Royal Canoe's albums feature hook-laden pop tracks packed with crisp, processed electronic textures. It's a tricky, intricate web of sounds delicately placed together, yet it maintains a spontaneous sensibility that allows the songs to shift, burst and retract in the blink of an eye. The most remarkable thing is how Royal Canoe are able to recreate this process live — with a few necessary changes that keep the performances both fresh and humanly possible without needing the help of any extra hands (though drummer Derek Allard comes close by playing with three drumsticks at once). Saturday's (September 10) set heavily featured tracks from their upcoming album, Something Got Lost Between Here and the Orbit, which showcased the band's wide range of sounds and textures. With their array of synths and MIDI orbs — synth pad triggers that emit light when hit — the band played to their strengths, navigating the tension between analog and electronic sounds. That contrast was most obvious exhibited with duelling drummers, one handling a drum pad and the other playing a good ol' fashioned drum kit. While the new material is less anthemic than earlier work — tracks like "Hold On To The Metal" and "Bathtubs" still stand out as the band's most sing-along-friendly material — the restraint displayed on new tracks like "I Am Collapsing So Slowly" and woozy R&B jam "Living a Lie" works, letting the band use sparseness as a weapon to let the choruses and hooks jump out at the listener. Royal Canoe are never overwhelmed by the multitude of their moving parts; rather, they utilize every part in harmony to craft intricately engaging pop tunes. Royal Canoe Share New 'Waver' Song "Peep This"